Annual Convocation of the MCM D.A.V. College for Women here today strongly advocated the need for focused attention on quality education and high standard research by reshaping the roadmap of academic curriculum to realize the goal of a knowledge society. Exhorting students to face the challenges of the outside world with a positive attitude, Mr. Patil said that the education is to help students to become good citizens of not only State or Country but of a whole world. Education should inform us about the meaning of life itself. Unless we know the meaning of life we cannot live a happy life. Education is to make us stand on our own legs. Education having these qualities should be imparted to the students, he added. The Governor said the focus of students in this competitive age should be to enhance their capabilities and confidence to achieve excellence through commitment, vision, determination and hardwork. 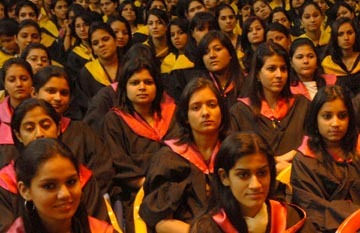 Educational Institutions have an enormous responsibility for building the Nation through the enrichment of higher education system and it is, therefore, imperative that there is an ideal integration of programmes of teaching, research, work experience and community development to enhance professional competence of our students to enable them to contribute to the Nation. Mr. Patil said that “Convocation is an important milestone in the education journey of a student. Many see it as the final pursuit after which they can proceed with their entry in the working environment while others see it as an opportunity to pursue higher studies”, he added. Mr. Patil further said that our country is on the move and has emerged as one of the leading nations of the world. He said that our people have the talent, capabilities and capacities and they have demonstrated their strength in various countries in hostile environments. Our Educational Institutions therefore have a special responsibility to equip our youth with the appropriate skills to come up to the required standard. He said that we must utilize all resources available at our disposal to explore and develop the potential of our students by stretching their abilities through innovative programmes. He appealed to the luminaries and members of academic councils to act as catalysts and to create new opportunities for our youth in different disciplines of education, research and developmental programmes. The Administrator gave away degrees and certificates to the students of MCM DAV College for Women.